A bright, lemony miso dressing is the perfect complement to the earthy soba noodles in this recipe for Lemon-Miso Soba Noodle Bowls. 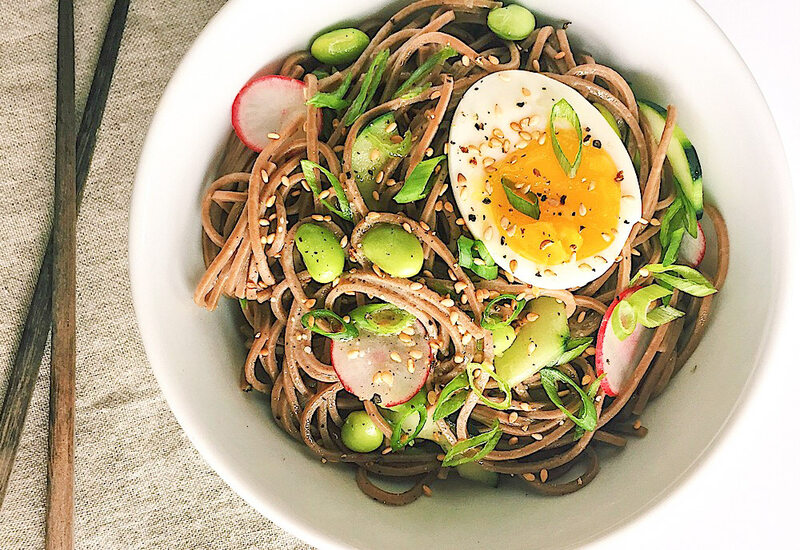 A flavorful blend of avocado oil, lemon juice, miso, tamari, maple syrup and sesame oil, is tossed with soba noodles, edamame, scallions, radishes, and cucumber. It is the perfect blend of texture and crunch. Each bowl is topped with a sliced soft boiled egg and sprinkled with toasted sesame seeds for garnish. Don’t want the noodles? Replace with quinoa or just make it a noodle-free bowl and increase the vegetables, adding shredded carrot and thinly sliced kale. Per Serving: 518 calories; 36g fat; 37.2g carbohydrates; 15g protein; 47mg cholesterol; 789mg sodium. Wow, this dressing is so good I want to put it on everything! I spiralized some zoodles and used that instead of soba noodles, delicious. I used POZOLE CORN instead of the noodles- my Mexican friends were thrilled at the new possibilities in taste for Pozole. I would follow miso anywhere so I decided to give this dish a go. I really liked the addition of the soft boiled egg on the top, I might do it with a pickled egg next time. I added in some leftover chicken also which was really tasty. I will definitely be making this again. Really, really loved this recipe. Such great flavors. I did add a little sesame oil because I love the way it pairs with the radishes, cucumber, and edamame. This is the perfect recipe for eating light. Replaced the noodles with with quinoa and added extra shredded carrots. The creamy soft boiled egg was perfect with it.